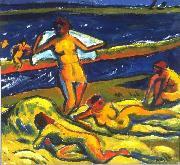 German Expressionist Painter, 1881-1955,German painter and printmaker. 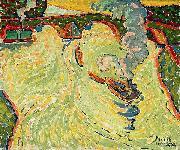 He was apprenticed as a decorator in Zwickau from 1896 to 1900, when he moved to Dresden to enrol at the Kunstgewerbeschule, where he met the architect Wilhelm Kreis and the painter Otto Gussmann (1869-1926) and obtained decorative commissions. He continued his studies from 1902 until 1906 as Gussmann's pupil at the Dresden Kunstakademie. 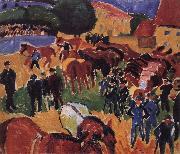 Through Kreis, Pechstein was introduced to Erich Heckel in 1906 and was invited by him to join DIE BRECKE, a group founded in the previous year that was quickly to become a major force in the rise of German Expressionism.